WASHINGTON — The National Intellectual Property Rights Coordination Center (IPR Center), led by U.S. Immigration and Customs Enforcement's (ICE) Homeland Security Investigations (HSI), has joined together with the FBI and six major American movie studios to launch an updated anti-piracy warning to be displayed on new releases. The anti-piracy warning will begin appearing in selected DVDs and Blu-rays released this week. The six movie studios, all members of the Motion Picture Association of America, have agreed to utilize the anti-piracy warning. 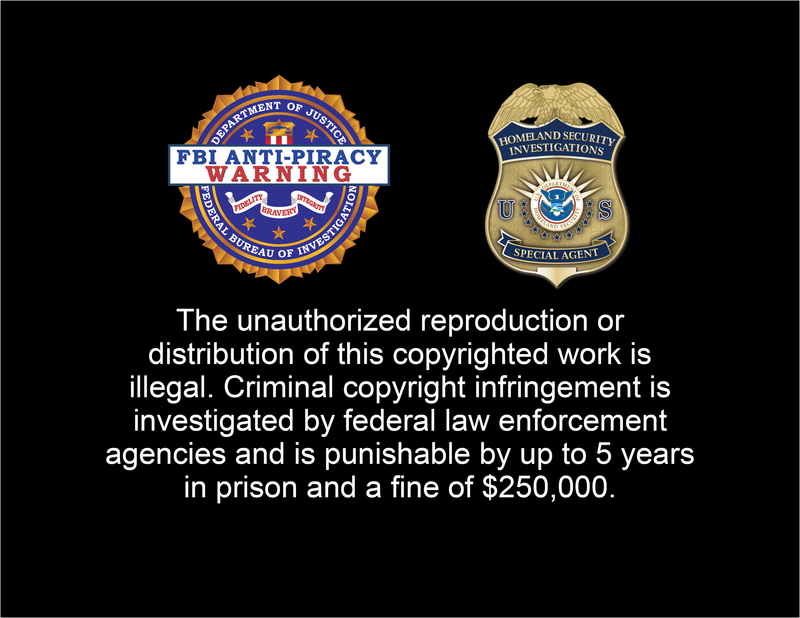 The joint FBI/HSI anti-piracy warning displays, for the first time, the HSI badge alongside the FBI anti-piracy warning seal and states that, "The unauthorized reproduction or distribution of this copyrighted work is illegal. Criminal copyright infringement is investigated by federal law enforcement agencies and is punishable by up to 5 years in prison and a fine of $250,000." 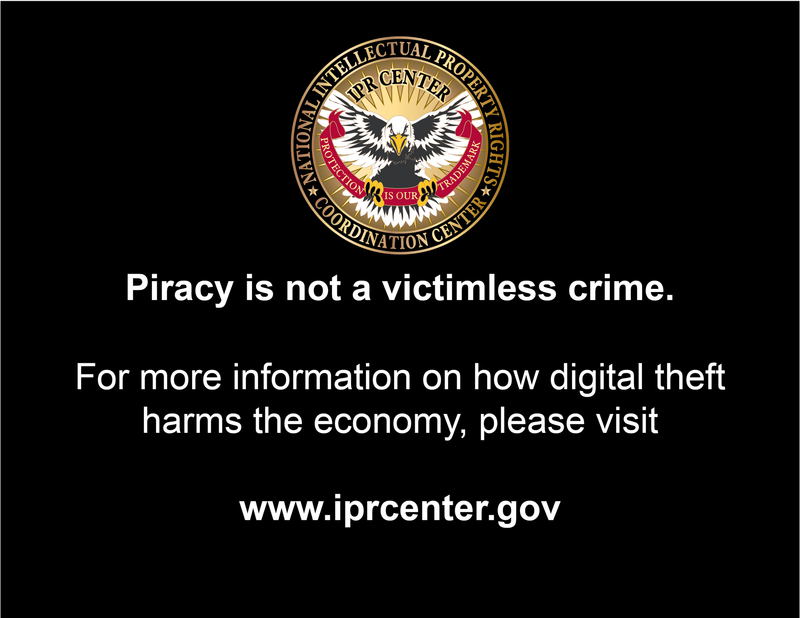 A second screen displays the IPR Center logo with the educational message, "Piracy is not a victimless crime. For more information on how digital theft harms the economy, please visit www.iprcenter.gov." "Our nation's film and TV business is critical to our economy," said ICE Director John Morton. "Its creativity and imagination have made American entertainment one of our greatest exports over the decades, but criminals are increasingly engaging in new forms of digital theft. Law enforcement must continue to expand how it combats criminal activity; public awareness and education are a critical part of that effort." The IPR Center works closely with public and private entities to increase awareness and information sharing about the harmful effects of piracy on American innovation, lost jobs and the economy. The IPR Center also brings attention to the organized criminal enterprises often behind IP theft and the public safety implications of counterfeit goods. In June 2010, HSI launched Operation In Our Sites, which targets online commercial intellectual property crime, including websites offering pirated movies and television shows as well as a diverse array of counterfeit goods, such as sports equipment, shoes, handbags, athletic apparel, sunglasses and DVD boxed sets. To date, more than 760 domain names of websites engaged in the sale and distribution of counterfeit goods and illegal copyrighted works have been seized as a result of Operation In Our Sites. Eleven individuals have been charged with crimes or arrested, and more than $1 million has been seized as criminal proceeds. As the largest investigative arm of the Department of Homeland Security, HSI plays a leading role in targeting criminal organizations responsible for producing, smuggling and distributing counterfeit and pirated products. HSI focuses not only on keeping counterfeit products off our streets, but also on dismantling the criminal organizations behind such illicit activity. The IPR Center is one of the U.S. government's key weapons in the fight against criminal counterfeiting and piracy. As a task force, the IPR Center uses the expertise of its 20 member agencies to share information, develop initiatives, coordinate enforcement actions and conduct investigations related to IP theft. Through this strategic interagency partnership, the IPR Center protects the public's health and safety, the U.S. economy and our war fighters.